An exit strategy for the armed occupiers in Oregon was supposed to be negotiated by now, but a county judge’s refusal to grant access to public buildings postponed the meeting. “We will have one soon, but we do not know when or where,” one rancher said. 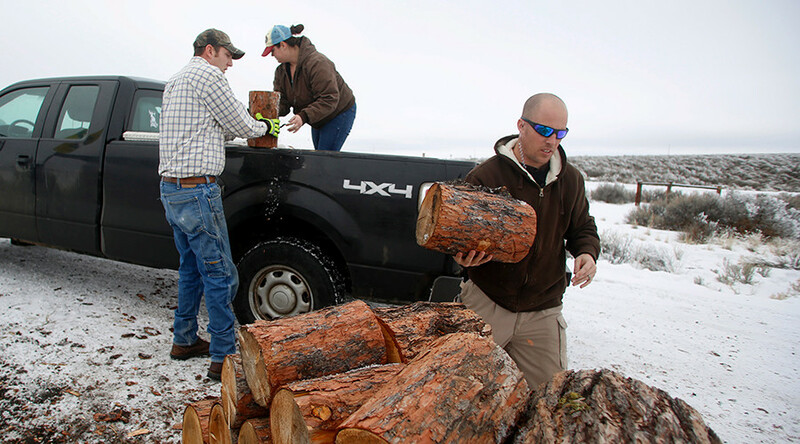 That rancher, Travis Williams of Drewsey, Oregon, sits on the Harney County Committee of Safety, a non-government makeshift group of six locals hoping to end the Malheur National Wildlife Refuge occupation as it enters its third week. The Committee of Safety is mostly aligned with the occupiers, officially named Citizens for Constitutional Freedom, when it comes to their demands and goals, but the CoS disagrees with their tactics. Nearly a week ago, they presented “articles of resolution” to the occupiers to outline talking points and an eventual diplomatic meeting with local and federal law enforcement. Harney County Court Judge Steven Grasty prevented the meeting from taking place between the Bundy group and the CoS, which was scheduled for January 15 on the county fairgrounds. “Given the recent activities at the Malheur refuge by the Bundys and the armed presence throughout the community by various groups, it is Harney County’s intent to provide the delicate balance in recognizing the public’s free speech be protected while at the same time protecting the public and the public facilities,” Judge Grasty said. The CoS is seeking to overcome that and possibly find a way to hold the meeting on Monday night, but they may eventually take legal action on First Amendment grounds, according to The Oregonian. Arizona rancher Robert “LaVoy” Finicum, one of the occupiers, told reporters on Friday that the leader of the protest, Arizona businessman Ammon Bundy, is readying a PowerPoint presentation for the meeting, whenever it takes place. RT’s Simone Del Rosario has been reporting from Burns, Oregon and the occupied refuge, speaking with community members, as well as protesters and law enforcement. In an exclusive interview with Bundy, Del Rosario asked about his group’s view of the law and its operations. To Bundy, the US Constitution “has been violated to the point that ranchers don’t have any rights,” and by “common law established by natural law” the ranchers deserve to control the public land claimed by the federal government. Bundy went on to describe his group’s sophisticated operations, including its “vast communications” and “deep pockets.” Yet with all of that, they have yet to conclusively demonstrate how they’re benefitting neighboring ranchers. On January 12, Bundy and his supporters destroyed a government fence that marked grazing rights for Tim Puckett’s ranch, claiming Puckett had requested more space for his cattle. However, the rancher told the media he had never met with the Bundy group and never asked for anything to be done to the fence. Puckett went on to say he had good relations with federal agents. No one has been charged in the fence incident yet, as federal law enforcers are staying quite a distance away to avoid triggering an escalation by a show of force. However, when one of the occupiers, Kenneth Medenbach, 62, drove a government truck from the wildlife refuge into town to pick up groceries at a Safeway, he was arrested by state police, making him the first member of the group detained since the occupation began 13 days ago. Protester arrested in Burns for driving stolen refuge vehicle. First arrest since siege started two weeks ago. Kenneth Medenbach, 62, of Crescent, Oregon, is accused of unauthorized use of vehicle - driving a refuge rig to Safeway in town. Also on Friday, back at the occupied federal facility, Robert “Lavoy” Finicum reportedly took down a surveillance camera atop an electric pole that was suspected to be operated by the FBI. Elsewhere on the refuge, government vehicles received new labeling to the occupiers’ liking. The public image of the occupiers is certainly mixed, though locally the loudest voices are in opposition. About 100 anti-Bundy protesters showed up for a rally in Burns on Friday – further evidence that Bundy misjudged how the much the local community would support his cause. Though Bundy was initially inspired to action by the prosecution of local ranchers Dwight and Steven Hammond, the father and son denied his offer of sanctuary under occupation. They opted to return to federal prison after being re-sentenced for starting sagebrush fires on their own land that touched over onto federal land as well. Although the Hammonds’ volatile relationship with the feds goes back decades, another group has an even starker one that goes back centuries. The Paiute tribe resents Bundy’s assertion that the land truly belongs to the ranchers when they have a treaty saying the federal government is the steward. “Did the ranchers just drop out of the sky into virgin territory that had never been touched by anybody?” local Paiute chairwoman Charlotte Rodrique told RT. While the federal authorities have kept their distance thus far, tensions within the community seem to be building. Burns Mayor Craig Lafollette told RT he serves a “very close-knit, resilient community.” He noted, however, that there has been “some division” since the occupation began, but he believes that the divide will subside once the standoff is over. “It’s not fair that this wonderful, peaceful community has been put in the limelight for this reason,” Lafollette said, relaying that Sheriff Dave Ward told him there have been “upticks” in threats, intimidation, and vandalism, including against Ward’s wife, whose tires were allegedly slashed, causing her to leave town for a week. Speaking with a former Bureau of Land Management worker of 30 years who requested to remain unnamed out of caution for his business, RT’s Del Rosario asked about the difficulties in settling disputes with ranchers.